You must have felt happy and satisfied after downloading a free mobile app, which also has a paid version. Are you wondering who buys the paid one when there is free available. 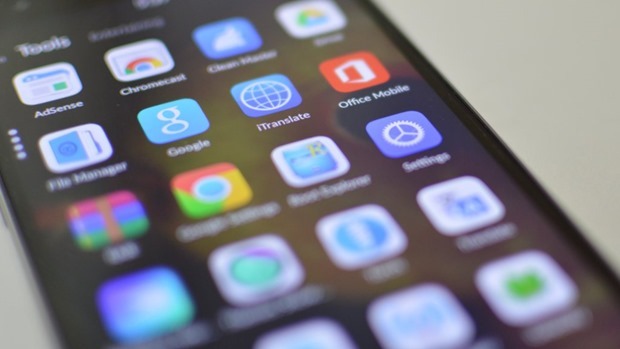 You must have used that app day in and day out, marveling at the free nature of mobile apps. But, have you ever wondered what exactly the price of a free mobile application is? Yes, the results may shock you. By downloading a free app, you are actually losing 16% more power, 22% more memory and upto 79% more data, compared to a paid app! The Researchers William Halfond from University of Southern California, Meiyappan Nagappan from Rochester Institute of Technology (RIT), Stuart McElroy of Queen’s University in Canada & Jiaping Gui from University of Southern California (USC) collaborated on a study to determine what exactly is the price which a end-user pays for downloading and using a free mobile application. The study would be published at the International Conference on Software Engineering (ICSE) in Italy in May this year. 4 Is Advertisement The Real Culprit? These researchers used Samsung Galaxy SII smart phone and analysed 10,750 free applications which were in the top 400 list of all the 30 categories in Google Play store between January to August, 2014. Using various patented tools, they analyzed the performance of the mobile phone while using the applications, and the results are indeed shocking. They analyzed only those free apps, which are supported by advertisements for monetization. The mobile phone, while using free apps with advertisements reported upto 33% more energy consumption, with an average of 16% more battery usage. The battery life after a full charge, thus, decreased from 2.5 hours to 2.1 hours, with 1.7 hours as the average slump. Central Processing Unit or CPU of the mobile was used 48% more while using the free apps, which means 22% more memory was consumed and 56% more CPU time was utilized. Now, considering that the advertisements which are shown in the free app to make money are part of the content, these apps consumed 100% more data bytes, compared to those apps which were paid. 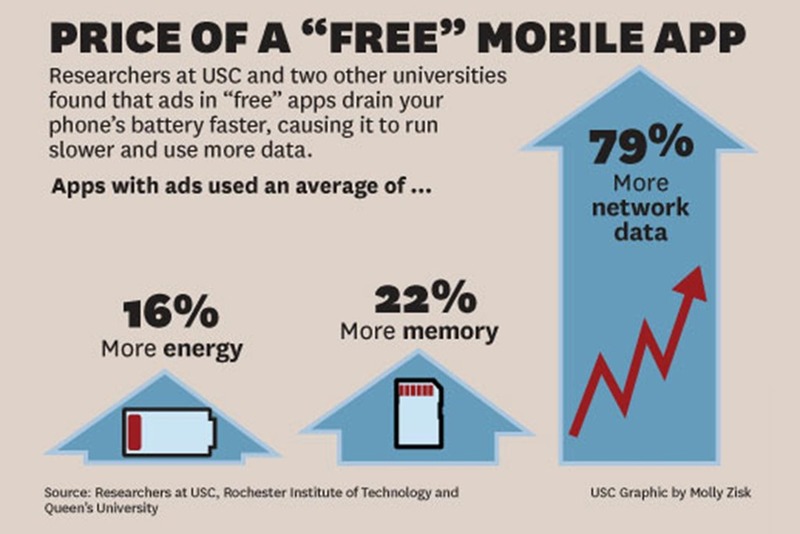 On an average, 79% more data was consumed by these free apps. The researchers used network of AT&T, and found that the free apps resulted in 1.7 cents of more data, whenever a free app was used. Due to the over usage of CPU, battery power and data, the overall performance of the mobile dropped, and the users were unsatisfied with the overall experience. The researchers also observed that consumers are sub-consciously aware of this situation, and this results in lesser rating for free apps compared to paid apps. Is Advertisement The Real Culprit? If we observe the study from the point of view of a marketer, then we will realize that the main culprit is advertisements shown in the mobile app. The revenues generated from the advertisements shown in the free app makes the whole effort worthwhile for the developer and the cycle continues. But if the advertisements are driving the performance of mobile lower, then should all apps be made paid and advertisements removed from the mobile eco-system? No, we don’t know the answer to this dilemma, nor does the researchers are aware. Maybe we need more research into this factor and come up with a feasible solution which balances the act. But the results from the study will certainly force the developers of mobile apps to think hard about their business model, and to compare the pros and cons of free vs paid apps. We all have been using Free Apps, especially in India, where paying for an app is still not the mainstream habit. I’ve been doing so since the time I had my first smartphone (around 5 years back), and this is for the first time ever that I’m actually thinking that Free Apps do come at a price. Apart from the fact that the in-app advertising are really annoying, all the more now with the new formats of it coming up and being way too obtrusive, performance of the device is something we never counted. And in a country like India, where data plans are dime a dozen (till now atleast), we actually don’t mind getting the free version and see the ads. Thanks for an eye opener, Mohul!